One of the most exciting home theater innovations in recent years is immersive sound. Building upon a strong foundation of legacy surround sound technologies, Dolby Atmos has emerged as the leading name in the immersive segment. In fact, the name “Atmos” has practically become the genericized trademark for 3D audio. Today, we’ll take a closer look at Atmos, discuss a few shortcomings, and highlight five must-own films laced with demo-worthy moments that will make your system shine (not to mention impress your friends). To better understand the power of Atmos, let’s briefly discuss the two previous kings of surround sound: DTS-HD Master Audio (DTS-HD MA) and Dolby TrueHD. Both legacy codecs were created to offer lossless playback of audio over 5.1 and 7.1 speaker arrangements, carrying information that mirrors a movie’s master audio tape. While these codecs are perfectly capable of delivering excellent surround presentations, they’re rather restrictive. First off, they require speaker positionings that reside on a flat plane. That means the resulting sound can appear to be somewhat two-dimensional. Secondly, both codecs force studio technicians to assign sounds to pre-defined speaker locations. For example, if a movie is mixed for a 5.1 arrangement, sound information can only be encoded to emanate from the front three channels, two surrounds, and a single subwoofer. In other words, sounds are designated to play from specific channels within that framework, no more and no less. 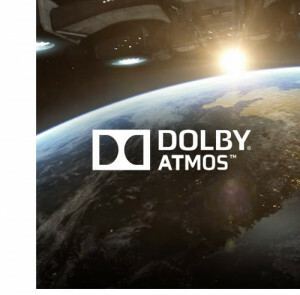 Dolby Atmos is an “object oriented” technology that requires additional ceiling mounted speakers to act as height channels. For example, a 5.1.4 Atmos system has 5 multichannel speakers around a room, one subwoofer, and four height channels. Current AV Receivers allow homeowners to deploy Atmos speaker systems ranging from 5.1.2 through 7.1.4 (with several permutations in between), giving enthusiast quite a bit of flexibility. Studio technicians are also granted flexibility because Atmos allows them to encode sounds to appear in specified areas of a 3D space, not from specific channels. The resulting Atmos meta-data is used by a system to generate sound using the speakers it has available. Of course, sounds can appear to come from above, but they can also be positioned in space. And as technology advances and home systems grow larger, current Dolby Atmos encoded movies have the onboard information to accommodate larger speaker arrays. Adaptability is one of the codec’s best attributes, offering great immersive sound to a wide variety of system designs. As amazing as Atmos has proven to be, it does carry some baggage (after all, every rose has its thorn). The biggest stumbling block is cost of entry, which can be rather pricey based on equipment requirements. There’s also speaker installation considerations, which can be messy and time consuming to integrate into your listening space. As you plan your Atmos system, establish a budget and take stock of what you already have in place. Keep in mind that you should strongly consider starting with a 7.1 base system (which allows you to tap the very best of what immersive sound has to offer). This begs the question: will a 5.1 base system work? Yes. However, home systems with the additional rear surround channels afforded by a 7.1 layout typically offer a better overall immersive experience. The next layer of system requirements is two to four height channels. Optimal systems have four ceiling mounted speakers, which can be tricky and time consuming to install. Much like the difference between 5.1 and 7.1 base systems, four height channels offer a much better overall experience than two. There is an alternative to ceiling mounted channels called Atmos “speaker modules.” These modules sit on top of a system’s left and right front channels (and two surround channels) and fire sound upward to mimic the presence of sound from above. While convenient and easy to install, this option is handicapped in its performance capabilities largely because mid and low frequency sounds are difficult to accurately reflect off a ceiling. It goes without mentioning that rooms with high and/or slanted ceilings further negate the effectiveness of speaker modules. Final cost considerations involve investing in an Atmos capable AV receiver (or pre-amplifier) and either a Blu-ray or 4K UHD Blu-ray disc player. Most Atmos AV receivers currently offer 5.1.2 to 7.1.2 onboard channel performance, with a small group offering true 7.1.4 onboard power (however, most receivers claiming 7.1.4 performance require an additional two-channel outboard amplifier). Then of course, you’ll need to purchase movies with Atmos tracks. You’ll find quite a few Blu-ray titles from recent years, but movie houses are beginning to reserve Atmos sound for their 4K UHD Blu-ray releases (which typically cost $5 to $15 more than standard high-def Blu-rays). With the bad news out of the way, it’s time to focus on the good news: Atmos’s powerfully immersive sound. Properly set up rooms deliver a front soundstage that has a heightened presentation with imaging that appears to stretch effortlessly upward. And overhead sound activity (such as a plane flying overhead) actually has the appearance of moving about in the sky overhead. Atmos truly delivers 3D sound. Once you have a system in place, you’ll need some demo material to take it for a test drive. Luckily, we’ve done all of the dirty work and have identified five incredibly dynamic must own titles that every Atmos owner should have in a collection! Gravity was originally released on Blu-ray with a healthy DTS-HD MA 5.1 surround mix. Roughly one year later, the movie was re-released as the “Diamond Luxe Edition” and given a full Dolby Atmos audio treatment. The resulting presentation was one of the first (and possibly best) Atmos mixes released to date. The film takes no time to launch your audio experience into high orbit with voices swirling around the room (even overhead) featuring pinpoint directionality matching onscreen happenings; it ends with the delightful chaos of a true outer space disaster. In addition to several intense action sequences during the film’s climax, its overall theatrical score also benefits from the addition of height channels. All-in-all, the differences between Gravity’s standard Blu-ray audio and the Diamond Luxe’s Atmos presentation are something akin to night and day. This is a must buy disc. Everest features an Atmos track on both its Blu-ray and 4K UHD Blu-ray releases, and, wow, what a treat! The hostile nature of the film’s setting is perfectly matched by an equally vicious audio attack that sends wind and ice whipping through your theater room. The movie starts rather tame, but its audio quickly builds as the cast moves their way up the mountain. The storm eventually arrives and delivers a dome of sound that transports you, the viewer, into a world of frozen danger. Adding to the delightful presentation is powerful low frequency activity that will send your subwoofer into overdrive. This gem is a near equal to the audio glory offered by Gravity. It, too, is a must own. Continuing with the disaster theme, 13 Hours has plenty of red-hot action that, of course, has an audio track that’s equal to the task. As the terror of the night unfolds, explosions, gunfire, and shrapnel, tear through the soundstage from all directions. It’s a hard-hitting exposition that’s punctuated by mortar rounds dropping from the sky. Every channel comes into play and your subwoofer gets a workout too, with skull crushing pulses of sound that match the power of munitions creating chaos on the screen. 13 Hours makes excellent use of height channels, even with more subtle sounds and atmospherics. Much like Everest and Gravity, it’s one of the formats most formidable presentations. Wick was just the fifth Atmos title released on Blu-ray, but that doesn’t diminish its importance to the format. Unlike our first three recommendations, this flick shines for different (subtler) reasons. It’s primarily about ambiance and music, both of which primarily take precedence over sheer chaos. Generally speaking, the audio track delivers a light and airy experience. That isn’t to say that there aren’t a few scenes with a more robust usage of height speakers (rain hammering from above, a helicopter flying overhead, and a raucous car crash) to round out a fantastic audio experience. If you’re looking for a slightly less ear-pounding affair, then John Wick should be on your short list! If there was a polar opposite to Wick’s laidback presentation, it would be Mad Max. Of course, considering the artistic flair and bizarreness laced into Mad Max’s visuals, it shouldn’t be shocking that the audio presentation is equal to the task! To start, the track is loaded with low frequency effects that will push the best of subwoofers to the limit with chest pounding bass. Piled on top of that subsonic layer are plenty of vibrant directional effects, pans, and sounds (desert storms, vehicles, and weapons) that explode overhead. It’s akin to riding an express elevator straight to the belly of true audio immersion, and its assault lasts from beginning to end. There are some that argue Mad Max is the ultimate Atmos experience, and that very well might be the case. So don’t risk missing this gem, buy it!